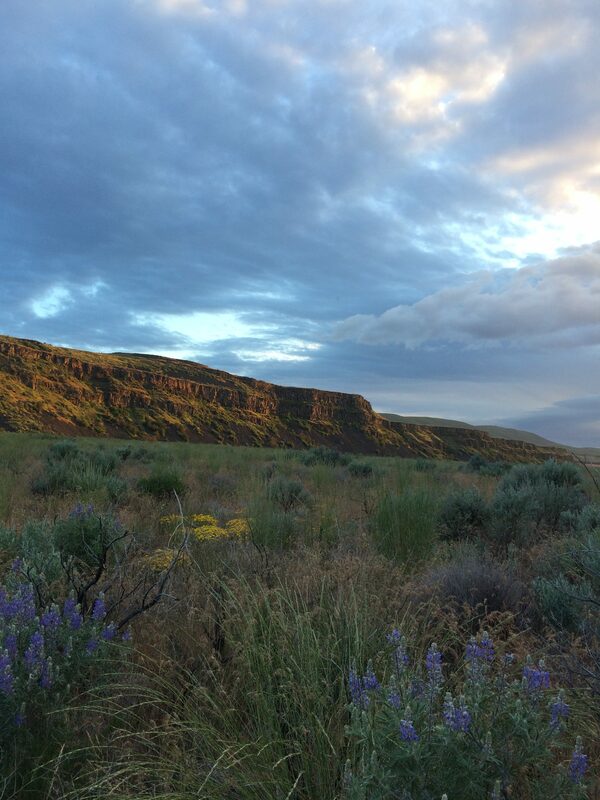 The Channeled Scablands – Off the Road. 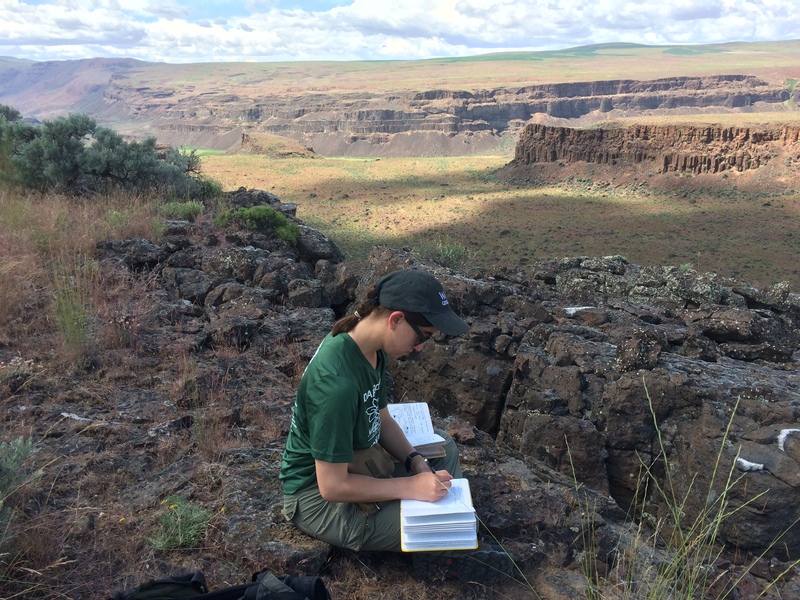 This May, I had the opportunity to join Mike Lamb, Isaac Larsen and Karin Legnick for some field work in the channeled scablands. The area is located in eastern Washington in the Columbia River Flood Basalts, a large igneous province that erupted and spilled basalt over a large portion of Washington and Oregon. During the end of the last ice age, the Cordilleran Ice Sheet retreated unevenly across the Pacific Northwest. As a result, meltwater collected in a giant lake in Montana, Lake Missoula, which repeatedly flooded eastern Washington. 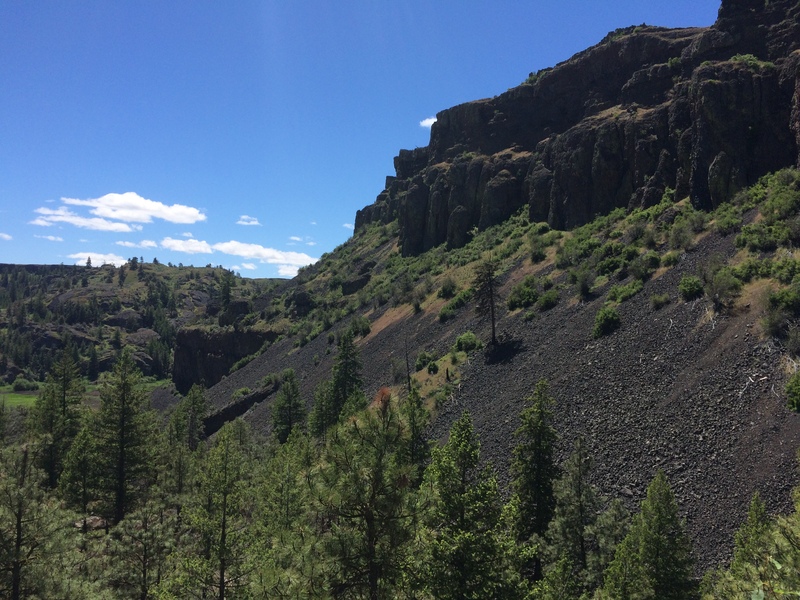 The floods were so strong that they stripped the area of its topsoil and carved canyons into the basaltic bedrock, creating the Channeled Scablands. 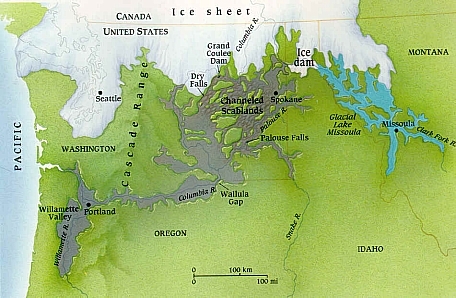 Lake Missoula flooded the Channeled Scablands repeatedly 17,000-12,000 years ago. The resulting topography is phenomenal, with deep canyons or “coulees” cutting through hundreds of meters of columnar basalts. The largest, Dry Falls, consists of a 400-ft high rock face that formed a temporary waterfall 7 times the width of Niagra Falls! The sides of the Coulees consisted of giant talus slopes from collapsing columnar basalts. All of the relief on the landscape was shaped by catastrophic flooding, with the areas on top of the basalt plateaus that were untouched by flooding consisting of flat farmland. The catastrophic flood hypothesis was initially proposed in the 1930s by J Harlen Bretz (yes, the letter J was his first name), who generated decades of field observations to support his claim. Geology had just established itself as a science that considered rocks to be deposited and eroded over millions of years, instead of relying on Biblical floods, and Bretz’s proposal was met with derision. However the discovery of Lake Missoula deposits by J. T. Pardee provided a plausible source for the immense flood, and led to the attribution of the area’s incredible topography to catastrophic floods. Some of the more spectacular features in the landscape include current ripples up to 50 ft high and potholes up to 100 ft in diameter, which convinced Bretz that the landscape must have been shaped by a river larger than any in existence today. The Channeled Scablands have a fascinating geologic and scientific history, and I am grateful that I was able to see them in person and help further work on their formation and development. The unique combination of the basalts and floods definitely helps to create such stunning topography! A lot of the boulders that we saw that had been transported by the flood were “pre-cut” basalt columns, indicating they were plucked whole from the bed instead of being slowly abraded down, like you might expect from less-fractured bedrock.